Originally published July 6, 2015; full text and original article visible here. “At first glance, it is a mystery how the prosperously rustic town of Ojai, California, came to host one of the world’s great festivals of modern music. Tucked away in a lush valley at the edge of Los Padres National Forest, sixty-five miles northwest of Los Angeles, Ojai is not the sort of place where one would expect to find an aesthetic of musical experiment. Its crisp air, sycamore groves, and mountain views have long attracted millionaires, spiritual seekers, and bohemians. In the nineteen-twenties, the Indian guru Jiddu Krishnamurti and various personalities connected with the Theosophical movement took up residence in Ojai. More recently, the town has attracted a smattering of Hollywood celebrities, who seem to pass through its streets unmolested. Amid the self-discovery talks, spa treatments, and rounds of golf, the Ojai Music Festival has been raising a finely calibrated ruckus each spring since 1947. Stravinsky and Copland have presided over performances of their own works, and Pierre Boulez has served as music director on seven occasions. The jazz great Eric Dolphy once played Varèse’s “Density 21.5”; Mauricio Kagel led his “Anagrama,” for speaking, spluttering chorus. In 1999, when I first visited, a gang of Finns banged on discarded auto parts that were dangling from Ojai’s ancient trees. (Most events in the festival take place at the Libbey Bowl, in the town park.) At the most recent edition, under the aegis of the percussionist and conductor Steven Schick, there were shrieks of flute and clatterings of gong; two works involving stones that were knocked together; austere chamber programs of Bartók and Boulez; a concussive hour of Varèse; a recitation of Kurt Schwitters’s Dada poem “Ursonate”; and a rendition of Morton Feldman’s five-hour trio, “For Philip Guston,” which began at 5 a.m. on a Sunday. On second thought, no one should be surprised that such an institution took root in Southern California. The esoteric sects that proliferated in the state at the turn of the last century had myriad connections to modernism in the arts. The lineage of experimental composers who grew up on the West Coast or were based there for part of their careers—Henry Cowell, Harry Partch, John Cage, Lou Harrison, La Monte Young, James Tenney, and Pauline Oliveros, among others—is central to contemporary music history. And the mighty exodus of composers from Nazi-occupied Europe to Los Angeles, led by Schoenberg and Stravinsky, prepared the conditions in which the festival flowered. To attend Ojai is to enter a happily topsy-turvy world where longtime patrons are as avid for new music as they are for classic repertory. 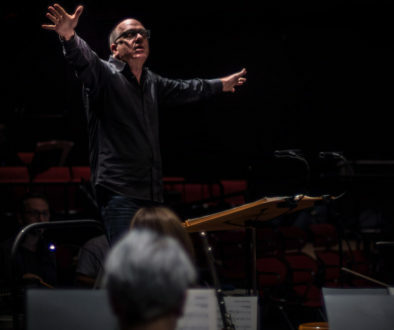 Works are sometimes criticized for being too accessible; such was a not uncommon reaction to a piece performed at this year’s festival, Michael Harrison’s “Just Ancient Loops,” in which the cellist Maya Beiser spun out soothingly euphonious lines. Conversely, after the clarinettist Joshua Rubin sailed through Boulez’s coolly spastic “Dialogue de l’Ombre Double,” a woman behind me exclaimed, “Now, that’s real music!” She employed the tone of relief that one hears at Lincoln Center when Boulez gives way to Brahms. What is different about Ojai? It has to do, I think, simply with the power of consistency: the festival stuck to its mission, year after year, decade after decade, until, at some point, its ideal audience became the real one. Ojai appoints a different music director each year. Dawn Upshaw, Leif Ove Andsnes, Mark Morris, and Jeremy Denk have participated in recent seasons, and Peter Sellars will unleash his enthusiasms in 2016. Schick, who teaches at the University of California, San Diego, and also leads the La Jolla Symphony and the San Francisco Contemporary Music Players, is not as well known as the others, but in the contiguous worlds of percussion and new music he possesses quasi-legendary status. 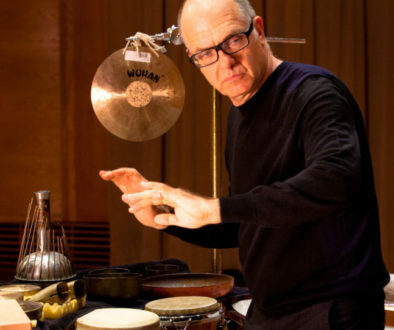 That he is committed to modern fare is a given; as he likes to say, he is older than his repertory, having been born in 1954, five years before Stockhausen wrote “Zyklus,” which is considered the first major work for solo percussion. Schick finds force and feeling in the allegedly cerebral world of the European avant-garde; at the same time, he brings rigor and focus to the American experimental and minimalist traditions. He is one of the supreme living virtuosos, not only of percussion but of any instrument. At the heart of the 2015 festival, which unfolded from June 10th to June 14th, was a solo program by Schick, and its centerpiece was “Zyklus”—a magisterially ambiguous creation that combines precisely notated sections with more open-ended passages that leave considerable choice to the performer. Schick’s interpretation, which he has been honing for forty years, is a sinuous audiovisual ballet in which hard-hitting, rat-a-tat drum solos intermingle with subtle, whispery sounds, as of a tapped gong or a brushed gourd. Although Schick meticulously plans each performance, he gives the impression of engaging in intuitive action, as if no score existed and the music were all muscle memory. The distinction between idea and gesture was similarly blurry in his accounts of Xenakis’s percussion pieces “Rebonds” and “Psappha,” and it disappeared altogether in Vinko Globokar’s “?Corporel,” which calls for a semi-naked percussionist to make sounds with his or her amplified body, slapping hands against skin. Members of the International Contemporary Ensemble, which has lately emerged as America’s foremost new-music group, joined Schick for the majority of the concerts, and they were willing collaborators in his quest for uninhibited instrumental theatre. The flutist Claire Chase, the co-founder of I.C.E., gave a free, impassioned rendition of “Density 21.5”—one that might have compared favorably with Dolphy’s, had it been recorded. She also tore into Mario Diaz de León’s “Luciform,” which has a trace of heavy metal in its helter-skelter, electronically enhanced cadenzas. The cellist Katinka Kleijn donned a mask to perform Du Yun’s “San,” an opulent fantasy on the ancient Chinese piece “Guangling San.” In Rand Steiger’s “Template for Improvising Trumpeter and Ensemble,” Peter Evans, in jagged lightning streaks of notes, seemed to revive the fusion of modern jazz and composition prophesied by the great Gunther Schuller, who died on June 21st. In all, there were eighteen concerts (I saw thirteen), featuring forty-seven composers, most of them living. “Sonic gluttony,” Chase called it, and some Ojai veterans came away feeling overstuffed. 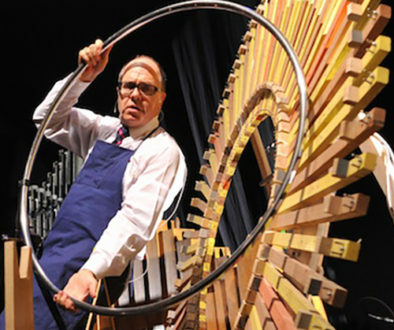 As Saturday gave way to Sunday, the schedule became a bit mad: at midnight, at the Libbey Bowl, Schick finished conducting Copland’s “Appalachian Spring,” and just five hours later, in the Ojai Art Center, he stood before a vibraphone and played, alongside Chase and the pianist Sarah Rothenberg, the opening notes of “For Philip Guston.” A groggy group of sixty people were there at the beginning, and more than a hundred were present at the end. To listen to Feldman’s vast, hushed creation as the world outside moved from night to day was a singular experience, yet I felt a little bedraggled by the end of it: such music requires more mental space for contemplation. The superhuman Schick went on performing for the remainder of the day. In several of the festival’s most memorable moments, intrusions from the outside were deliberately staged. At a morning concert at the Besant Hill School—an institution whose founders include Krishnamurti and Aldous Huxley—I.C.E. presented Anna Thorvaldsdottir’s “In the Light of Air,” for viola, cello, piano, harp, percussion, and electronics. The piece began in low light, with filament bulbs hanging from the ceiling. The instruments offered up a subdued, eerie fabric of timbres: ghostly glissandos on the viola and cello, fingertips and Super Balls brushing the strings of the harp and piano. In the course of four movements, this evanescent material acquired mass: droplets of melody and harmony precipitated from the air. Just before the end, darksome bitonal chords began crashing on the harp and piano, like the bell of a phantom cathedral. Suddenly, the wall at the back of the auditorium was rolled aside, ushering in the bright-gray light and chilly breeze of a cloudy Ojai morning. Nothing I witnessed in opera houses this past season was as dramatic.